Question: right now I am using Molotow acrylic premium paint and it is really streaky and it wont juice very well. What ink or paint do you recommend for this marker that works really well? 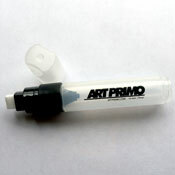 Answer: (AP Reply) This marker we use as our test for mostly alcohol based dyes to see how well the ink handles. The nib we find is really tightly woven which is great in holding it/s shape for thin inks but hard for heavily pigmented paints. You can either beat up the nib a little by loosening up the fibers (bending it back and forth or running it along sand paper) so pigments flow through better. Pumping it on a separate canvas to saturate the nib is also recommended. Try these. This is still a fairly new marker to us and we/re trying to get that hang of it as well, thanks! Question: Yo. How does the nib on this marker compare to the pilot mini super color? Are any sides on this nib the same as the longer side of the mini pilot super color nib??? Answer: (AP Reply) 10mm is almost a 1/2" wide straight edged nib compared to the smaller 1/4" wide angular edged nib. Question: That's what I thought but I'm not sure why it's doing that with flowpen ink, it's not like it's super pigmented like marsh or soultip paint or anything so I assumed it was from the nib. And because I was able to run the same ink through an eggshell Es-3. Answer: (AP Reply) If there is gunk gumming up around the nib then the ink is too thick. Is the streaking from the ink or the marker?